I cannot say with certainty how this drink got its name -- there is neither egg nor cream in the recipe -- yet, the name has stuck. It is typically made with chocolate syrup, milk, and seltzer water. 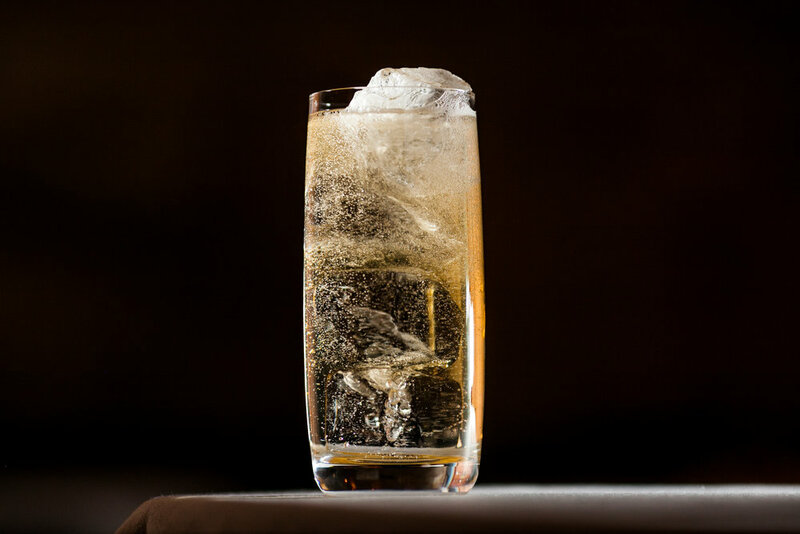 This cocktail takes some inspiration from the frothy, chocolate mixture, but with a different kind of bittersweet approach. While stirring, top off with sparkling water or Club Soda. Measures of Aperol, Cocchi Americano Rosa, Cold Brew Coffee, Simple Syrup, and Whole Milk. Settle back and enjoy your frothy Aperol Egg Cream cocktail. Some bars are cozy dens, built inside caves of paneled wood. 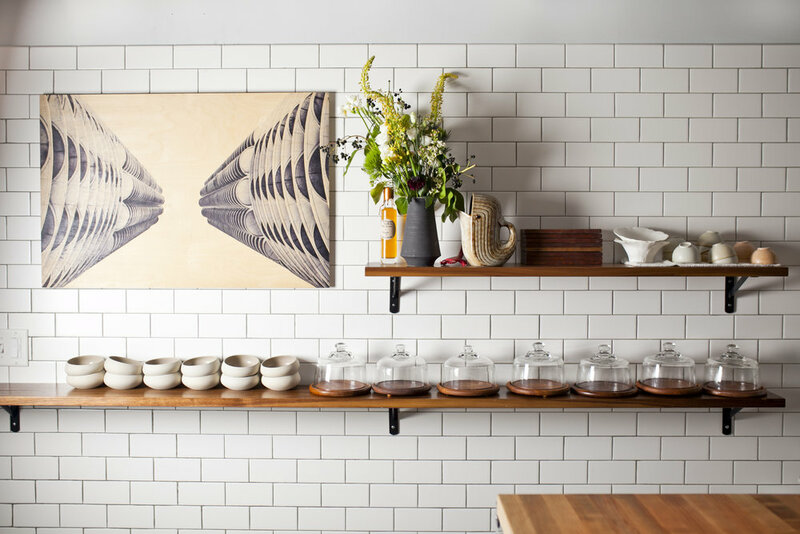 Other bars are sleek and modern, cold castles of marble and steel. There are bars with windows, views, skylights, and there are those with only the glow of burning candles and the occasional ray of light from a streetlight across the street. The two "bars" where I create cocktails and Sammy photographs are all and none of these things. The kitchen counter at home is cold, hard stone, but the walls are bright and warm like mustard seeds. The north-facing window allows some light in during the day, and at night we can see lights from the train, cars, and lamps outside. Location: Oriole; a bright moment before opening. At Oriole, the bar space is tucked away, out of sight. Once ready, cocktails, wine, and spiritfrees are served on tables cloaked in white, in a lofty room with natural beams of light before sunset and the bright glow of lamps after dark. Sometimes it is good to move away from the usual. Dim the lights and see if the cocktail is still as striking when the visual elements are blurred. Raise the lights. Is the sprig of mint fresh or withered? Are there brown spots on the twist, or is it curling, dried out from being cut hours ago and left out? These are all details that may be missed in the dim light of the bar, which are put in focus with the flash of a camera. 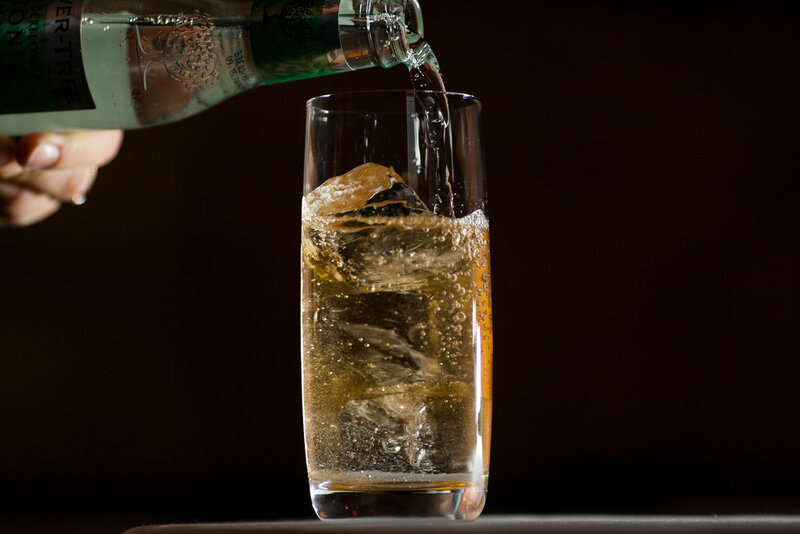 Let the drink be camera-ready, in any light. 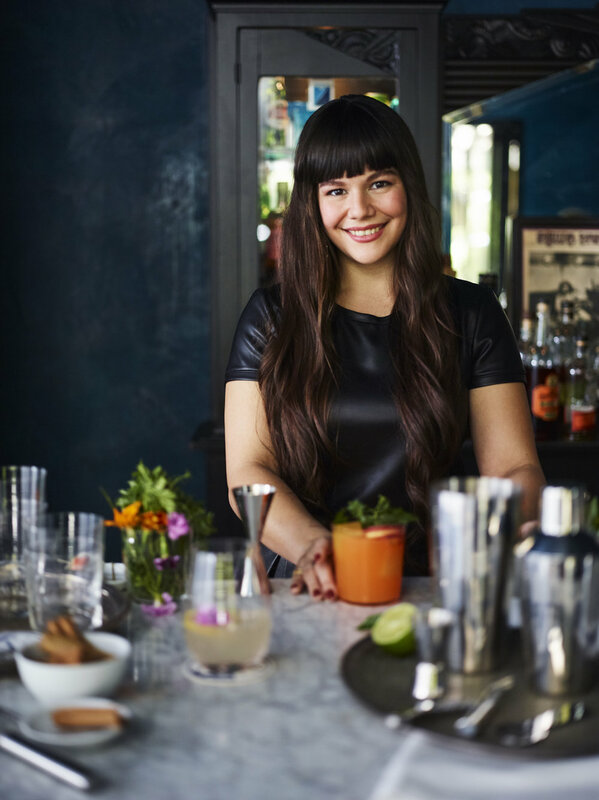 It is important to take a moment to acknowledge the ambiance which the bar environment creates, and explore how to use that to highlight the drinks in the most effective way. With a confetti of ingredients scattered across the base of the glass, the coaster, the bar, this scene begs the question, what happens if I pick up the glass? A mess! I probably wouldn’t play this kind of practical joke on you at the bar. But for a photo shoot with Sammy Faze, it is fun to move away from the practical and into the poetic with a little bit of cocktail styling. If a picture is worth a thousand words, perhaps a spritz of embellishment will help bring more to the story of green tea, hibiscus, vanilla, and Champagne? It makes quite a different, does it not? Time for some more fun with cocktail styling. It is fascinating to me how differently a cocktail may be perceived based on the angle of the viewer. Through photography, we are reliant on the lens and the focal point dictated by the photographer’s eye. 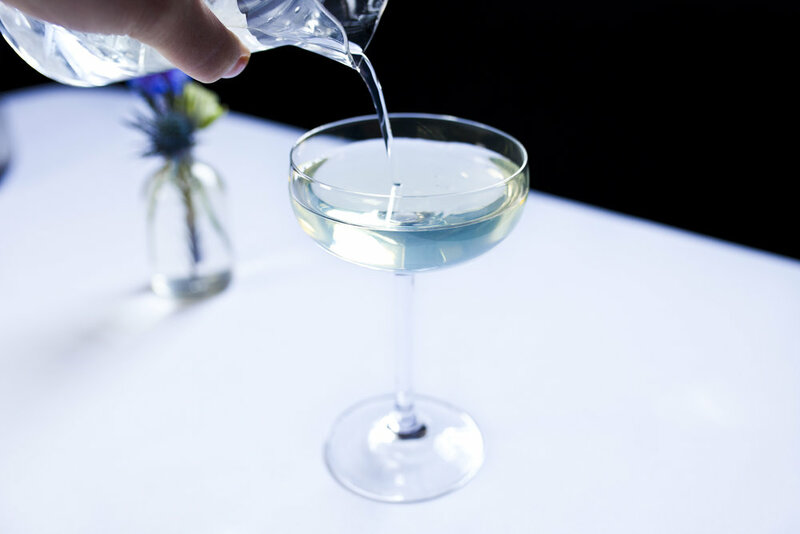 However, at the bar and on the restaurant floor, the glass and cocktail are moving elements, going from empty to full, naked to garnished, on the bar-top to the guest’s lips. At each moment the glass is seen not only by the bartender and the person for whom it is intended but by the entire room. For this reason, I like to think of the drink as a floral arrangement that will be set in the middle of the room. It should be gorgeous to the person facing it, of course, but also to the guests who see it passing by on a tray, or sitting across from the one who got the drink. 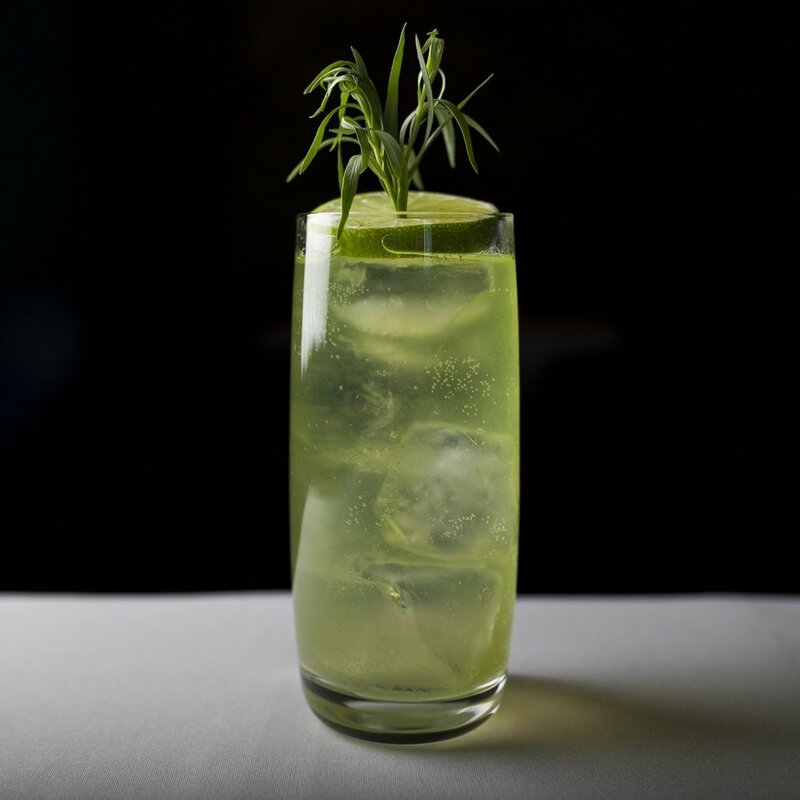 This is the cocktail Going Green, with Gamle Ode Dill Aquavit, Dolin Dry Vermouth, Green Chartreuse, and St. Germain. The garnish is a Dianthus flower pierced through a sage leaf for the effect of flower and leaf together, with beautiful aromatics of green. This is this ever-so-popular overhead shot, a position that few of us are ever actually in when we are looking at a drink, but a really fun way to showcase the drinks as if it were confined to the plane of a flat circle. The glass truly is the canvas. The density of the cocktail dictates what may be floated or painted on to the drink. When there is ice in the glass, it serves the role of continuous chilling, but it also acts as a support for garnish. Keep in mind that like the angle at which the drink is seen, time has a way of warping perspective as well. 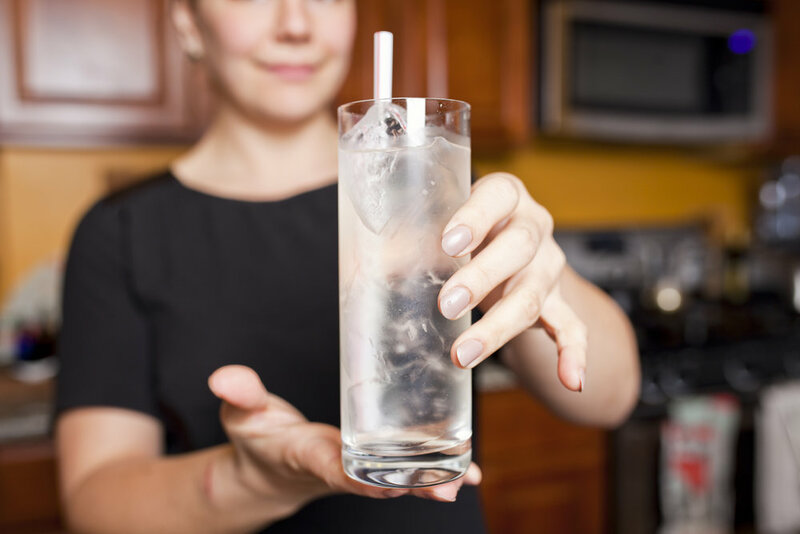 When using ice, it is important to think about what happens as the drink is being sipped, and the ice is melting. How does the garnish look once the drink is halfway gone? Each of these drinks "ages" in a different way. On the left, the Hummingbird Highball. The dill is held to the side of the glass by the lime clip. 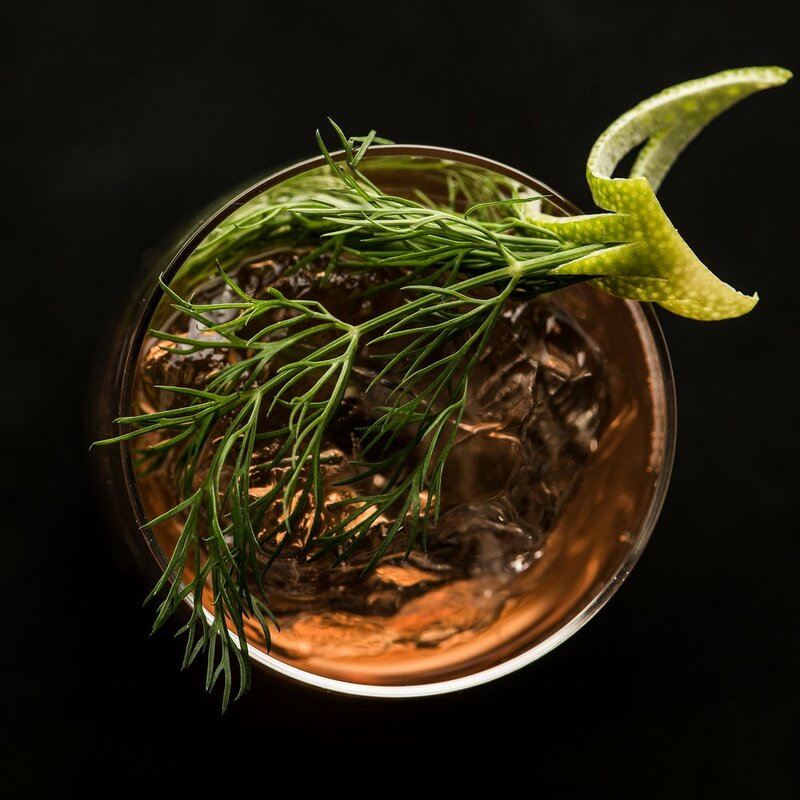 Therefore, as the drink is sipped, the dill slowly follows the ice downwards but remains on the side of the glass as an aromatic element. In the center, an egg white cocktail. Egg whites create the perfect white canvas for painting with aroma, color, and flavor. In this case, aromatic bitters with fresh chamomile flowers and greens. 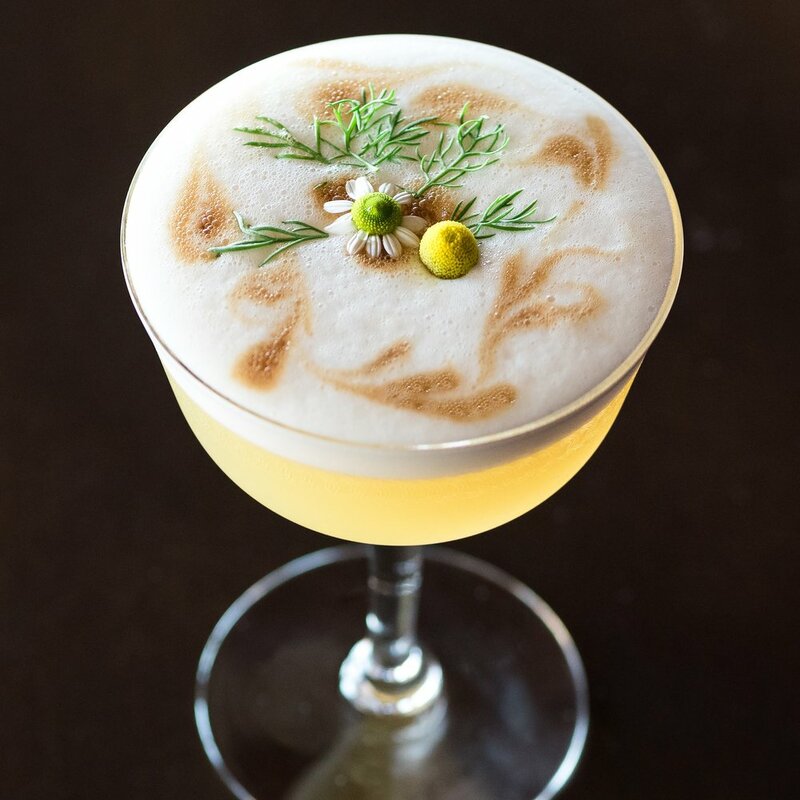 The micro foam of the egg white retains its texture and hold as the drink is enjoyed, slowly creeping towards the bottom of the glass, but never losing its structure. Finally on the right, the Hammersmith Palace spirit free (nonalcoholic cocktail). A fountain of tarragon bursts from the center of a lime wheel. This lime will acts as a flotation device so that as the drink goes down, the lime keeps the tarragon upright. 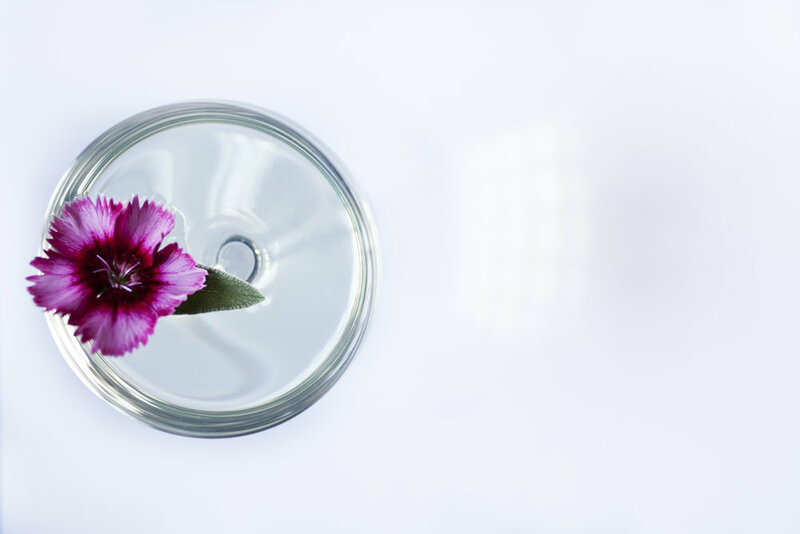 While a bit unrealistic, my aim is for a drink to be as beautiful and camera ready when it returns to the glass washer, as when it was just made and placed in front of the guest. This time, one year ago, I was home. I think I was most excited to introduce Sammy to Japan. But it had been five years since I had returned home, and as the island came into view from the plane, I felt my heart beat a little stronger, with the joy of being home again. At the time Sammy and I were boyfriend and girlfriend. Now, we are engaged. He asked my parents for their blessing one of our first evenings with them. They asked him to wait a couple of days before they could give their answer. We went off on a journey to explore Japan and visit Japanese Whisky distilleries. It was extraordinary to revisit the place I grew up and to go to cities I had never been before. It truly was like seeing everything with new eyes. To stand in a rickhouse amongst barrels and barrels of whisky ageing quietly under the watchful care of passionate workers, gave me goosebumps, and makes each pour of whisky from those distilleries that much more meaningful to me. Upon our return to my parent's house, while I must have been asleep, Sammy sat with my parents into the wee hours of the night, and they gave us their blessing. He told me this story as we were leaving Japan to return to Chicago, but the actual marriage proposal didn't come until we were truly ready ourselves. I suppose that is a story for another time. Until then, here are some gorgeous photos of my homeland, the food, and the people. Have a dram of Japanese whisky as you look over these if you can. I think it would be quite perfect. There is the opportunity in life, for many different beginnings and fresh starts. At the outset of this year, I may have surprised some people when I left the job that had brought me some amount of notoriety. I knew that it was time to move on, and I decided to trust my gut and initiate the next phase of my career: a break. I tried keeping a blog, of sorts, once. This was years ago. Longer, it feels, back when I was living and working in Baltimore. I was creating, and I was excited about the journey of an idea to final product. I am going to write again. This time, as a way to get my thoughts down, and to lay my convictions out. I have been fortunate enough to work with a few talented photographers, who have captured my ideas, finalized, in the glass. I hope to use this website and blog as a platform to share the art and inspirations. I have a collection of notebooks holding thoughts and processes — pictures, diagrams, and recipes. Sometimes there are poems or words that struck a chord and that I wanted to remember for later. These books are stashed about the house, in different purses, bags, beside the bed, and on various shelves. Some are chock full of ideas, simply bursting at the binding, while others are half-full, more indicative of a change in subject, place, or time. My aim is to go through these archives of visions and dreams and to recreate and reconceptualize those that speak to me. It is time to digitalize the recipes that have been lost in the pages, perhaps to be recreated one day as it was created, or maybe as something new. So here I go. Perhaps no one will see this, but that is okay. This is something that I choose to do for myself. Maybe, someone will stumble across a phrase or image that speaks to them, and, if that happens, I will be glad.